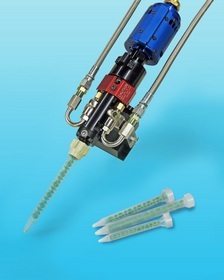 NEWBURYPORT, MA--(Marketwired - Jul 15, 2014) - Ashby Cross Company has introduced an electrically driven dynamic mix & dispense valve for mixing low to medium viscosity adhesives where static mixers cannot adequately mix two components. Founded in 1976, Ashby Cross Company is a leading manufacturer of adhesive and fluid dispensing equipment for both single and plural component reactive materials. The company offers a full line of multi-component adhesive dispensing equipment for epoxy, polyurethanes, silicones, acrylics, adhesive and structural bonding materials used in potting, encapsulation, coating, resin transfer molding (RTM), doming and sealing operations. Ashby Cross Adhesive dispensing equipment is available in piston pump and gear pump versions, selected by viscosity and application. Their dispensing systems provide reliable, repeatable metering technology for a wide range of applications including; potting/encapsulating electrical circuits, molding and mold making, filter manufacturing, structural bonding, adhesive dispensing, filling and packaging, and gasket forming. The DYNA-STAT® Dynamic Mix & Dispense Valve is electrically driven and combines adjustable high-shear mixing with disposable mixer chambers that eliminate the need for a solvent flush cycle.